MY FIRST RECIPE POST OF 2015!!!! I knew it had to be epic, because that’s what 2015’s going to be for me: epic. I mean, I’ve got a cookbook coming out, I’m getting married to the love of my life, and I have a few other tricks up my sleeves. 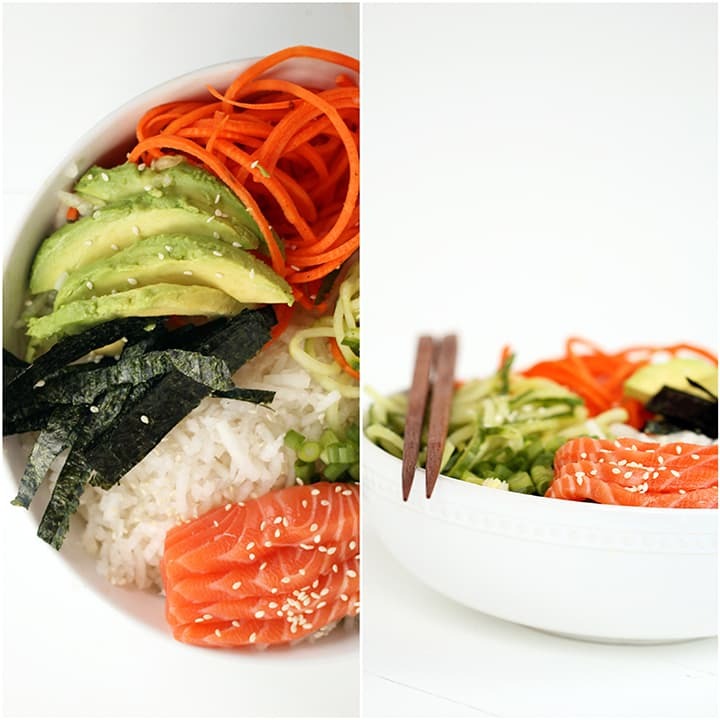 So, yea, epic: like this sushi bowl. 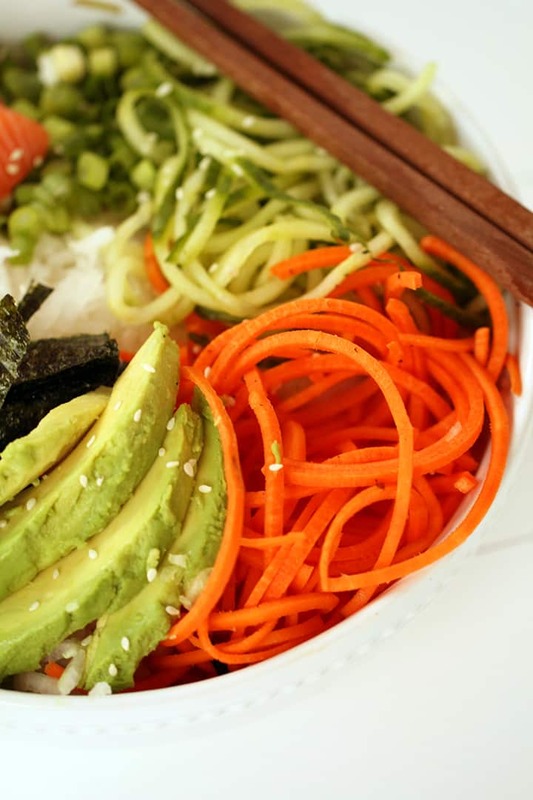 I’ve been meaning to make a spiralized sushi bowl for a while, because a) everybody loves sushi and b) sushi has so many spiralizable elements. What better occasion to finally make this than for 2015’s first recipe? 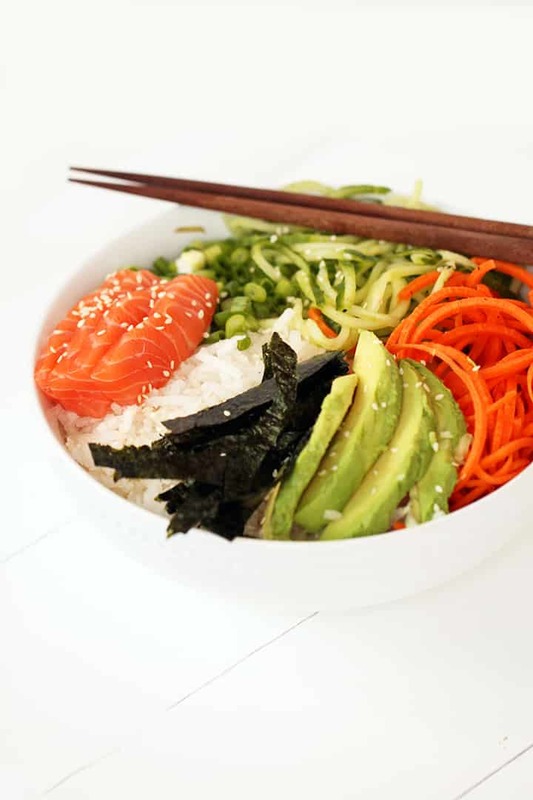 Originally, I had wanted to use kani as the main protein and have this titled as a “spiralized california sushi bowl.” Unfortunately, I was scrambling to stock up all of my posts before I left for Christmas/New Year’s and the grocery store I was at didn’t have kani and I didn’t have the time to drive somewhere else, so: salmon sashimi. 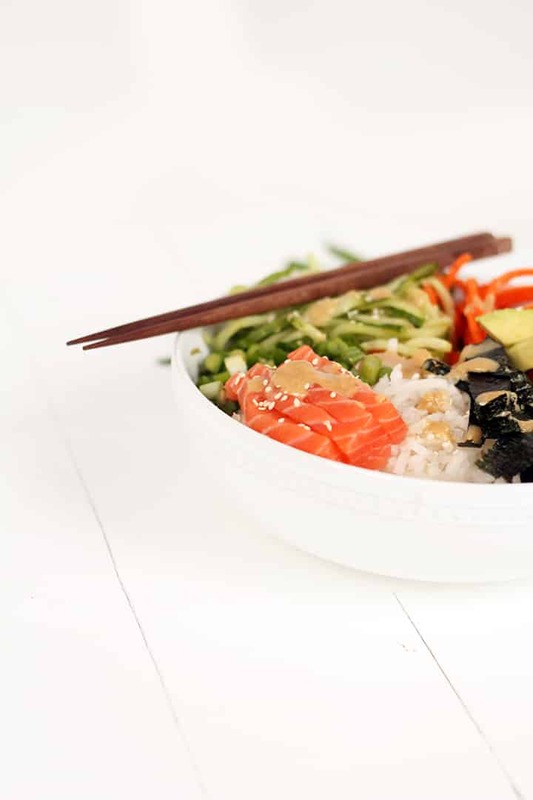 Salmon sashimi works perfectly here and the ginger-miso dressing brings out the freshness in the salmon. However, if you don’t like salmon or don’t have access to the freshest, substitute in anything: kani (ha! ), shrimp, tofu, edamame beans, or just leave it out and make it 100% vegetarian and simple. The seaweed is nice and salty. I actually really love adding seaweed to soups and other dishes for extra umami. You know, that “pleasant savory taste” that’s indescribable. 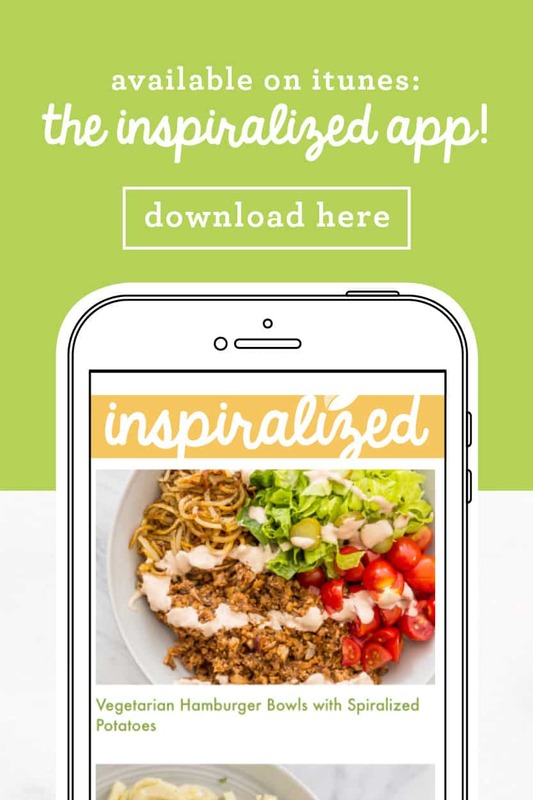 Anyway, this recipe, overall, is the quintessential segue into an unbelievable year for Inspiralized. 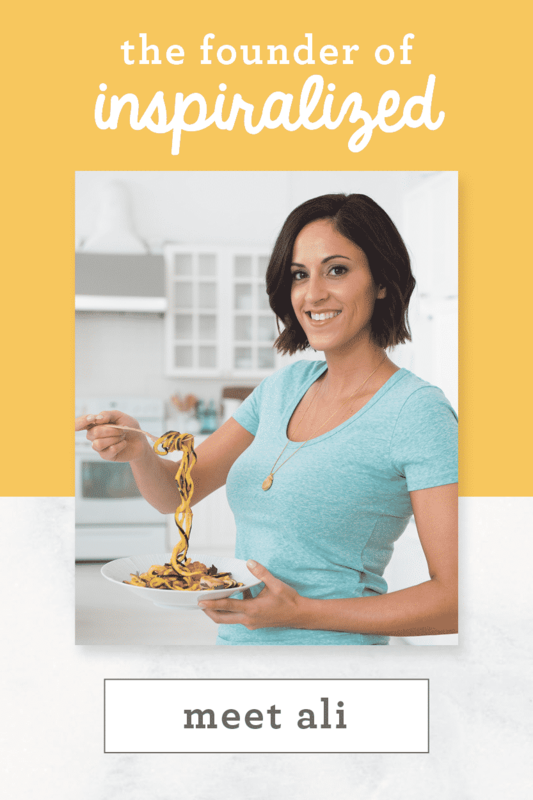 It shows the creativity and versatility of the spiralizer and it demonstrates perfectly how spiralizing can transform your favorite traditionally unhealthy dishes into healthy versions – sometimes with even more flavor! Okay, I’m done. I’m probably en route home from the Dominican Republic right now, sad to be leaving the warmth, but excited to start this New Year! 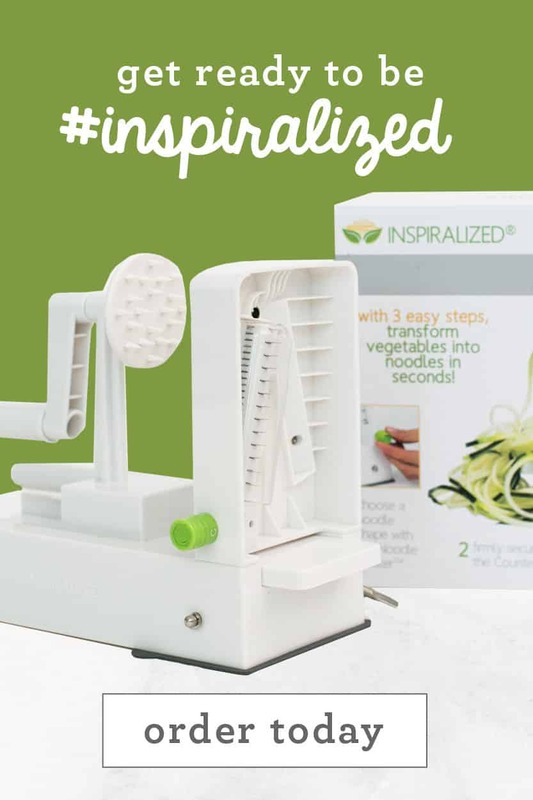 What are your favorite ways to be creative with the spiralizer? 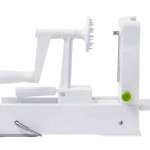 Place the daikon noodles into a food processor and pulse until rice-like. If needed, squeeze the excess moisture out of the daikon “rice.” Set aside. In a medium bowl, whisk together all of the ingredients for the dressing until creamy. If needed, use a food processor. 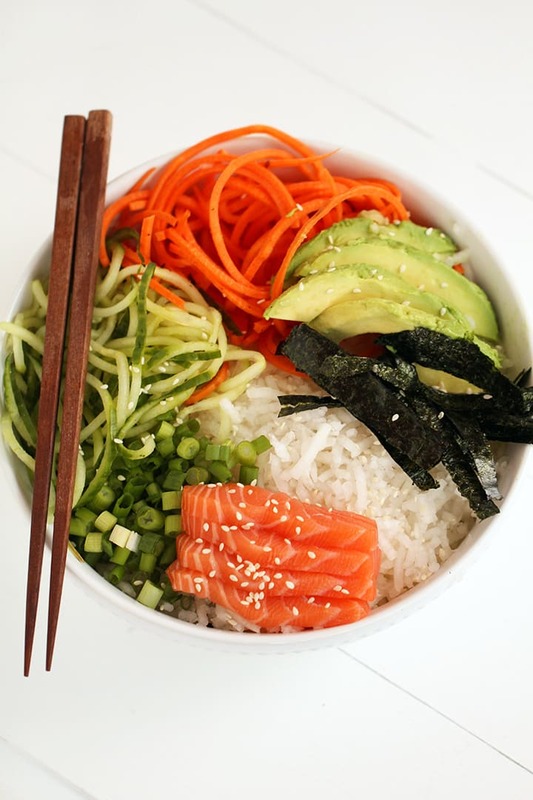 To assemble, place even amounts of the daikon rice into bowls and top with even amounts of cucumber, carrot, salmon sashimi, avocado, scallions and sesame seeds. Top each with dressing and serve. Amen! Add a bit of it to the dressing for that wasabi spicy taste! This looks so good I can't wait to make it! What kind of miso paste do you use? Thanks and congratulations on all your accomplishments. 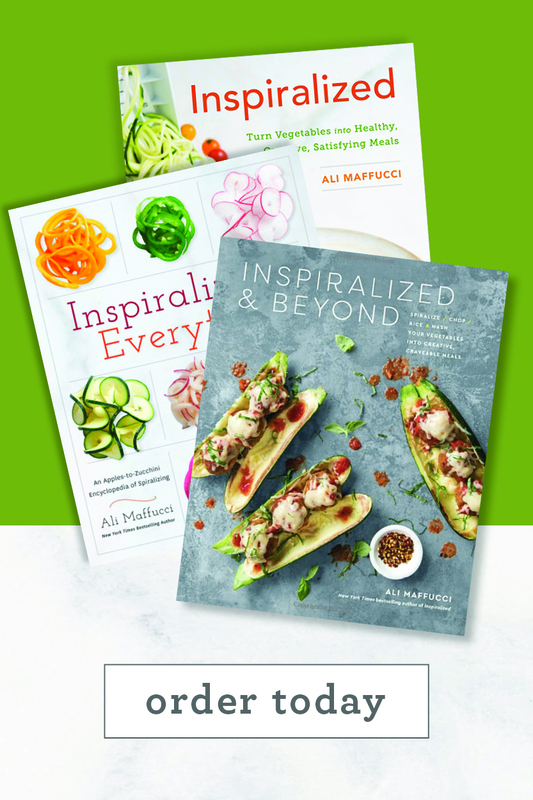 I will definately buy your cookbook when it comes out and I'm ordering my spiralizer today and can't wait to make your recipes for myself and my family. This one I think I'll make for my best friend since we haven't seen each other in awhile and I always like to cook for her or not cook in this case lol. 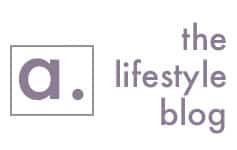 So happy I came across your site. Happy New Year! Wow - what a beautiful dish! I love sushi and can't wait to try this out! Anne, thanks so much for the kind words! Glad you like it! Happy New Year, Ali! I love to cook your recipes and read your posts! All the best to you for 2015! Great recipe! Tried it with tofu and it was delicious. The dressing is wonderful and will be great on salads, too. Congrats on the big year ahead! Oops! Yes, it's a whoops - thanks for catching that and thanks for all the kind words! Happy New Year! WHY is everything you make so drool-worthy?! 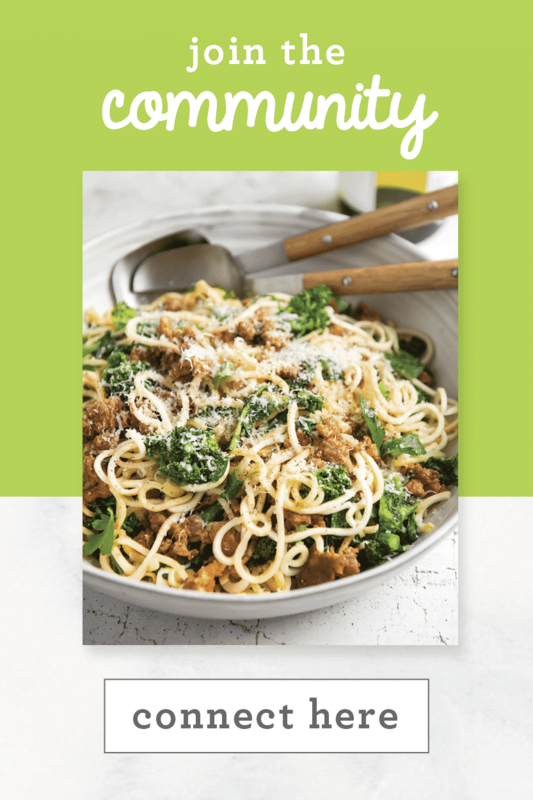 This looks amazing, and cant wait to try all of your new recipes to come this year! Thanks for being a great (healthy!) inspiration and whipping up amazing things! Thank you Katie, this comment made my day!! Oh yum and yum again. I just made this and whilst not quite as pretty looking as yours, it was EVEN BETTER than it looks in taste. I didn't use quite as much honey, but the fresh ginger in the dressing made the whole thing so fresh. My first inspiralized recipe and it was pure genius. Thank you! Katrina - so happy you liked the dish! Noted on the honey! I think this recipe is EPIC!! It is an awesome recipe. My salivary glands are working overtime just by reading this. It is EPIC, just as your year is going to be and mine too!! Hi There. I LOVE your site. You are sooooo creative. The recipe for turnip 'rice' stuffed acorn squash is amazing. Here is my question.... I have an awesome recipi for linguini with white clam sauce. 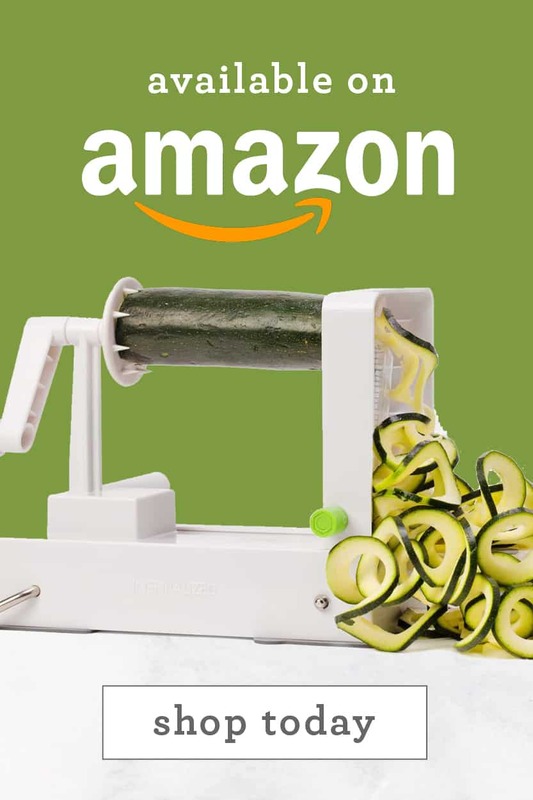 I tried it with zuccini noodles, but it got too watery. Any other ideas for the pasta that would go with clam sauce?